Please Send Your E-Petition Now! Below is an importat alert and request from Robert Ritchie, which needs your attention and help, would be grateful if you will read to the end and take action. Thank you. It shows a host being held in a needle-nose plier while an off-screen person lights a butane torch and thoroughly burns the host to a crisp. It was posted on YouTube by user name HostDesecrator. Can such a name leave any doubt as to the author’s intentions? I think not. Is this not pure malice…silent, brutal, and straight-to-the-point? Beneath the offensive video are a series of viewer comments about the video. They demonstrate to any reasonable person that these host desecration videos have the primary purpose of inciting hatred against the Catholic religion. you catholics just dont get it. your church is about nothing but power and control. this 'hate speech' thing is just another way RCC/popes/catholics are seeking power to shut everyones mouth by taking away freedom of speech. your church/popes are against freedom of speech & religion that we enjoy in america (for now). everyone read the syllabus of errors by pope pius the 9th to learn what the catholic church is really about and why people fled to america to escape papal/church tyranny. YouTube’s own Hate Speech Policy disqualifies these videos from being hosted by YouTube. Please Tell YouTube CEO Susan Wojcicki To Take Down These Videos. But to be effective, I need you to pray and to help me mobilize hundreds of thousands of Catholics immediately in a massive peaceful, pious, and prayerful e-protest. If tens of thousands of Catholics pray and speak up, there's a chance YouTubewill enforce its policy and remove these sacrilegious attacks on the Holy Eucharist. Desecrating the Holy Eucharist is "hate speech" in my book. PS: --- Our previous e-petitions to YouTube against the Eucharist Desecrations videos posted online were a success -- the user who had posted 55 sacrilegious videos of the Holy Eucharist pulled them off the Internet. Thank God! And now it is time to speak out against sacrilegious videos once again. common decency and the purity of children and families. Above all, it offends God. and wreck the last vestiges of modesty in America. You can sign the petition by CLICKING HERE. Thank you! Dear Friends here is a petition for your prayers I received from Robert Ritchie of America Needs Fatima I am shariing his letter with all you good friends, in the hope that the rosary will be recited daily by all who read it. Now more than ever, we need the rosary. I mean, why else would Mary have repeated the command “Pray the Rosary” with each and every one of her appearances at Fatima? But do we have peace? No, sadly, not in the world, not in our cities and towns, not even in our individual lives. So, we have to ask, are her promises empty? But our response to her requests at Fatima have fallen short, big time. In this Fatima Centennial year, let’s join together in redoubling our efforts to pray the Rosary and pray it with conviction, trusting in her promises, like the student in Bagdad…. Amid that horrific bedlam and terrible carnage, the student courageously hung on to her rosary and prayed even as the Islamic terrorist accosted her. By the grace of God, she was spared from death. Thankfully, this poor child of Mary discovered the power of the Rosary and the protection of the Mother of God. But what will it take for us to make that same discovery? What will it take for our loved ones to reach for their rosaries and look for the peace that only God can give? Hopefully, not a terrorist attack. On this Feast of the Rosary, Dot, please take a moment to read about the Fifteen Promises of the Rosary and its power. Like a true mother, Our Lady gave the solution for every crisis we may find ourselves in. Do you have financial troubles? Do your children wander from the Church? Does your marriage cause you more pain than joy? When all seems lost humanly speaking, when events in our lives take a turn for the worst, we must not give in to the temptation that her promises are empty. Instead, let’s take a firmer hold on our Rosaries and unite our hearts with hers—today and every day until the triumph of her Immaculate Heart. PS: Click here and discover the solution to all your problems. But remember what Jesus used to say to the people He cured: “…your Faith has cured you.” So pray your Rosary with Faith and devotion and let the wonders of Holy Mary’s grace amaze you. 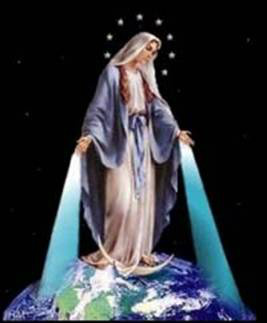 Peace is an element that is distinctly present in the message of Fatima. we may become builders of a more fraternal world. may he be strong in faith, courageous in hope, and zealous in charity. Who live and reign with God the Father, in the unity of the Holy Spirit, one God, for ever and ever. Our Father. Hail Mary. Glory. I invite you to spend some time every day for the next nine days consoling the afflicted Heart of Mary Most Holy. Unite your heart to hers in this Novena to Our Lady of Sorrows, and feel her loving presence beside you in your struggles.